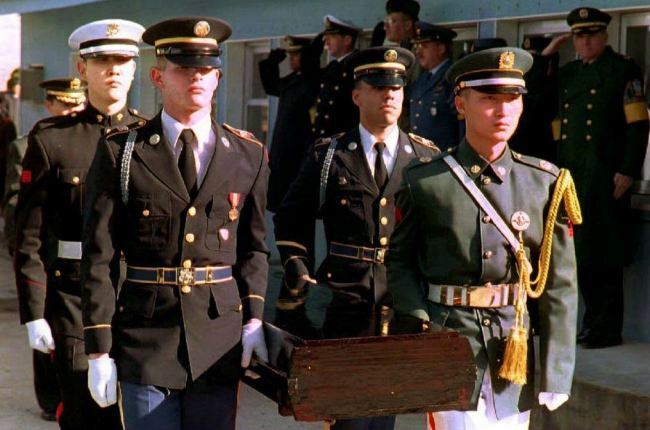 The US and North Korea have agreed to discuss the repatriation of American troops’ remains from the 1950-53 Korean War on Sunday. The US State Department had announced after US Secretary of State Mike Pompeo’s visit to Pyongyang Friday and Saturday that the two sides were to meet at the inter-Korean border village of Panmunjeom on Thursday. The North said it would discuss the issue with the US, but never mentioned a specific date. On Thursday, US Defense Department and United Nations Command officials waited for four hours at the Joint Security Area in Panmunjeom, but the North Koreans never arrived. The North proposed later that day to meet Sunday, US State Department spokesperson Heather Nauert said in a statement. “Vice Chairman Kim Yong-chol agreed in his dialogue with Secretary Pompeo to have his team meet with an American team in Panmunjeom on or around July 12th to move forward with the repatriation of American service members’ remains,” the spokeswoman said Thursday. The return of American troops’ remains from the Korean War was among the agreements between US President Donald Trump and North Korean leader during their June 12 summit in Singapore. The two leaders signed a joint statement that says the US and the Democratic People’s Republic of Korea commit to recovering the remains of prisoners of war and those missing in action, including the immediate repatriation of those already identified. Trump has highlighted the return of remains as a meaningful outcome of the summit. According to diplomatic sources, the North proposed higher-level talks Sunday. Nauert did not mention the level of officials attending Sunday’s meeting. The US moved 100 wooden cases to Panmunjeom late last month to carry the remains from the North. The cases are on stand-by at the United Nations Command area in the JSA.